"I’ve Never Seen A Move Like This In The 21 Years I’ve Been Watching This Market"
In Turkey's ongoing attempt to crush currency manipulators, yesterday we reported that in addition to launching a "probe" against JPMorgan, the biggest US bank, for daring to cut its TRY price target, as well as threatening unnamed "manipulators", on Monday Turkish authorities took a page of the Chinese currency manipulation playbook, when they made it virtually impossible for foreign investors to short the lira as they soaked up virtually all intermarket liquidity, potentially threatening to kill the economy. As we reported yesterday, the overnight swap rate on Monday soared more than ten-fold over the prior two sessions to more than 300%, the highest spike on record going back to the nation’s 2001 financial crisis as offshore funds clamoring to close out long-lira positions failed to find counterparties and the cost of a lira short exploded. Think Volkswagen short squeeze but for a currency, or FXwagen. Well, FXwagen went turbo on Tuesday, when this unprecedented move continued as Turkish Lira swaps exploded again, more than doubling overnight, and hitting an insane 1338%. With the cost of borrowing liras overnight hitting unprecedented levels - because local banks are under pressure not to provide liquidity to foreign fund managers who want to bet against the lira - this forced investors who want out of their lira positions to instead sell other Turkish assets to access the currency they need to close those trades. This forced investors to dump Turkish bonds and stocks on Wednesday, sending local markets in freefall, and pushing the yield on two-year Turkish bonds jumped above 20% on Wednesday while stocks slid the most since August. Fund managers including Japan’s Daiwa SB Investments Ltd. said they are rethinking investments in the country. Commenting on this unprecedented move in swaps, Bloomberg's Mark Cudmore notes that he doesn't recall "seeing this happen to any liquid and freely tradeable currency in the past 15 years." For any fund that has any Turkey exposure, VAR levels will now have shifted significantly. This means that such funds will be pressured to reduce risk elsewhere until any Turkey exposure is closed. Although, the situation in Turkey has not evolved suddenly and it's unlikely that any but dedicated EM funds have much exposure. It also means that Turkey is doing its best to burn bridges with all foreign investors, both bulls and bears, which for a country that for the past decade has been entirely reliant on outside capital inflows, could spell a death sentence. Meanwhile, unable to express their negative views on the economy via the currency - for now - Turkey bears have found a different way of betting on a Turkish economy implosion, namely Credit Default Swap, which soared to 454bps on Tuesday, a 40bps spike, and the highest since last summer's crisis. 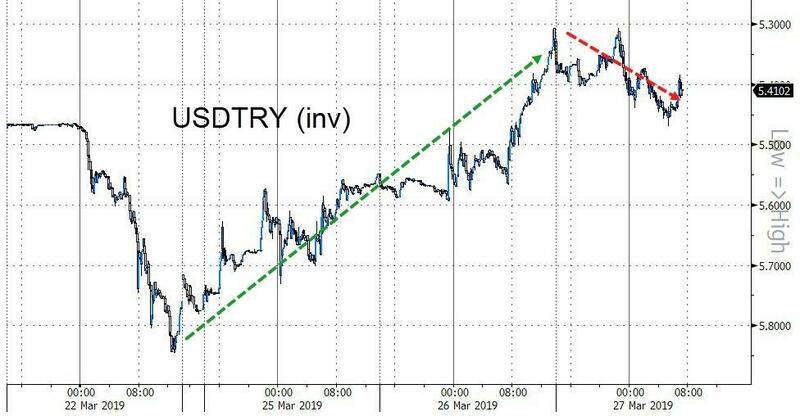 Of course, Erdogan's vendetta against the shorts, and the elimination of virtually all liquidity just to force an FX squeeze, means that the broader economic slowdown and raging inflation, which is the true reason behind Turkey's simmering crisis, is about to get much worse. 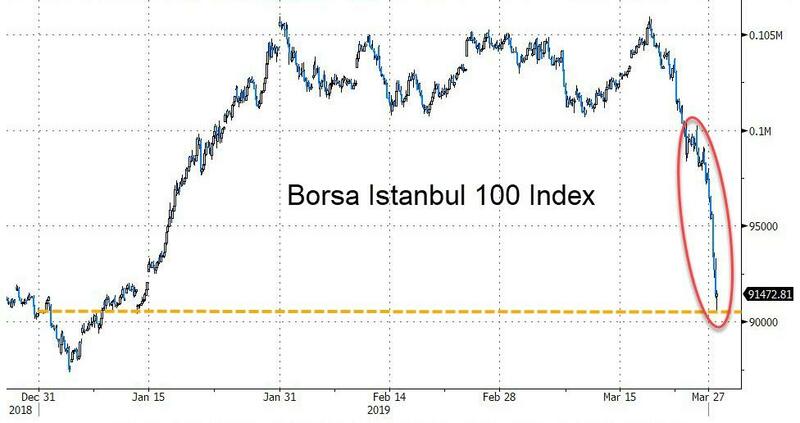 Meanwhile, with local banks burning through reserves to defend the currency on the front-end, and with shorts no longer present, it is only a matter of time before the currency collapses once more, only this time driven not by a flood of shorts but as longs capitulate ahead of what increasingly looks like another Turkish crisis.